We’re constantly working to help make email more secure for everyone. These efforts are reflected in security protections like default HTTPS in Gmail as well as our Safer Email Transparency report, which includes information about email security beyond just Gmail. To that end, in partnership with the University of Michigan and the University of Illinois, we’re publishing the results of a multi-year study that measured how email security has evolved since 2013. While Gmail was the foundation of this research, the study’s insights apply to email more broadly, not unlike our Safer Email Transparency report. 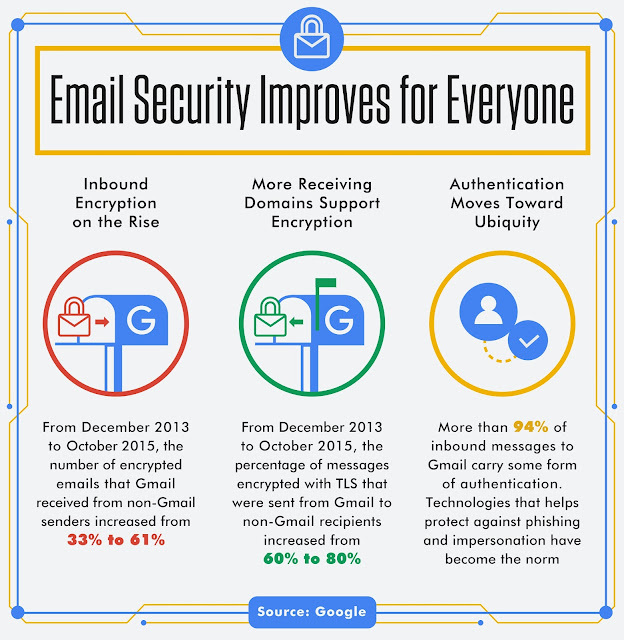 It’s our hope that these findings not only help make Gmail more secure, but will also be used to help protect email users everywhere as well. Our study identified several new security challenges as well. Second, we uncovered malicious DNS servers publishing bogus routing information to email servers looking for Gmail. These nefarious servers are like telephone directories that intentionally list misleading phone numbers for a given name. While this type of attack is rare, it’s very concerning as it could allow attackers to censor or alter messages before they are relayed to the email recipient. While these threats do not affect Gmail to Gmail communication, they may affect messaging between providers. To notify our users of potential dangers, we are developing in-product warnings for Gmail users that will display when they receive a message through a non-encrypted connection. These warnings will begin to roll-out in the coming months. All email services—Gmail included—depend on the trust of their users. Partnering with top researchers helps us make the email ecosystem as a whole safer and more secure for everyone. Security threats won’t disappear, but studies like these enable providers across the industry to fight them with better, more powerful protections today and going forward.